In February 1936 while an extreme cold wave swept the nation, Willard W. Beatty boarded a train to go from New York City to Washington, D.C. The energetic progressive educator had just been appointed Director of Indian Education in the U.S. Bureau of Indian Affairs. “White children’s loss will be Indian children’s gain,” retorted the editor of Progressive Education Magazine. When FDR’s Secretary of the Interior, Harold L. Ickes, tapped Beatty for the position, he hoped to advance the work of what was called the “Indian New Deal.” In the eyes of many government officials, academics, and reformers, the Indian New Deal presented the last opportunity for the federal government to begin to undo its institutionalized oppression of American Indians. Now Willard Beatty would take up a challenge that had interested him at least since his college graduation in 1913 – perhaps further back, for he had awakened early to this persecution. That occurred because he grew up under the wing of his uncle Earle A. Walcott, having been orphaned at the age of ten. It happened that his uncle was a civic leader, author, journalist – well, really a polymath with a zeal for reform – who became involved in nearly every issue that affected the state of California between 1890 and his death in 1931. Earle Walcott reared Willard in San Francisco during remarkable times. He introduced him to history, art, literature, and more. After Willard graduated from high school and went off to Berkeley, Earle and his intellectually precocious nephew remained close. The development of deep lifelong interests, especially if they originate outside the classroom, has always intrigued me. There’s schooling, on the one hand, and education on the other. My guess is that Willard Beatty’s attraction to American Indian culture, and his concern about the obstacles faced by Native Americans, grew out of two particular occurrences. The first relates to The Commonwealth Club, a public affairs forum founded in San Francisco in 1903, whose members studied Progressive Era issues. They were journalists, educators, judges, legislators, architects, philanthropists, urban planners, businessmen, etc. Over the years, they explored problems that ranged from prisons to child labor to conservation. The club become known nationally for tackling controversy. Even politicians considered its work above reproach. A founding member of The Commonwealth Club, Earle Walcott became its secretary in 1909. That year, the program included “Indian Rights and Wrongs.” Walcott invited three guests to make remarks following the presentation. Third, Cornelia Taber, chair of the Northern California Indian Association which aimed to teach self-sufficiency and the gospel. These three people represented the way things were for California’s Native Americans around the turn of the 20th century. They meant well, but it was business as usual with negligible improvement in quality of life, education, and opportunity. However, historians consider the 1909 meeting an important step in bringing attention to grievous policies. Willard Beatty, whose uncle drew him into the work of the Commonwealth Club when he was quite young, surely found the presentation enlightening. A second event animated Beatty’s interest in American Indians: San Francisco’s 1915 Panama Pacific International Exposition. The 1906 earthquake created an opportunity for the city to reinvent itself. Among the most vocal proponents of a new urban vision, Earle Walcott made the case for hosting a world’s fair even as the city smoldered. Within a year, he had helped to form the Panama Pacific Exposition Company. A reproduction of the Grand Canyon of Arizona and the Pueblo Indian village will be the Atchison, Topeka and Santa Fe Railroad’s exhibit at the 1915 Universal Exposition. Indian tribes and villages will include representatives of the Pueblo, San Domingo, Navajo, Zuni and Hopi tribes of Indians. They will present their dances and customs in native costume. . . 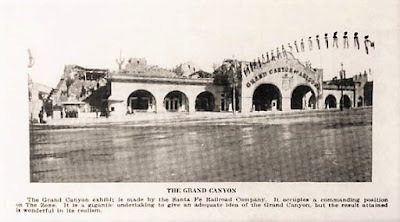 The Atchison, Topeka & Santa Fe Railroad built a "Grand Canyon exhibit"
Elsewhere at the fair, tour-goers viewed the Smithsonian Institution’s vast collection of photographs of American Indians, as well as “specimens showing the advancement of the Indian in civilization” – blankets and rugs created by students at government-run Indian boarding schools. Neither The Commonwealth Club nor the organizers of the 1915 Exposition could claim that their work improved the lives of the California Indians. However, the 1909 meeting and 1915 exposition did inspire Willard Beatty. Beatty addressed hundreds of issues in Native American life until he retired from the Department of Indian Education in 1952. These included health, discrimination, kinship, and poverty. Today, historians debate Beatty’s legacy, especially his postwar tilt toward a policy of assimilation -- which he thought inevitable. Beatty’s nephew, who spent some time in the field, once told me that the family connection proved to be a mixed blessing. Still, there is the story of young Willard Beatty; filled with passion, committed to action.